Imagine being able to retarget your web visitors via direct mail, email and/or phone. Well now you can! 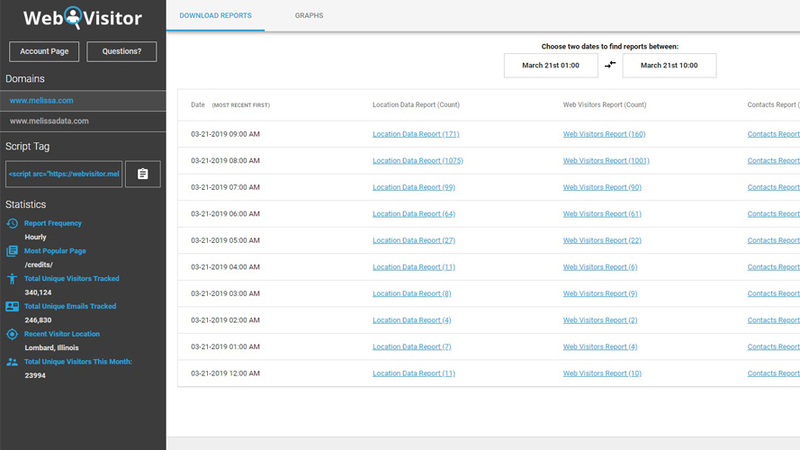 WebVisitor tracks your website traffic, and then matches it to our consumer database to return name, address, email, phone number, lat/long coordinates, and IP address. Our service helps you identify your web visitors so you can put them into your sales funnel and market to them at every stage of the buying cycle – It’s a game-changer! WebVisitor also provides the exact pages a user visited, along with the number of times, and how many times that user visited your site. Melissa provides all this information via reports within a user dashboard. Based on your business needs, we provide hourly, daily, weekly or monthly reports. Supplement the base WebVisitor plan with detailed demographics, including age, marital status, household income and much more! Call 800.800.6245 for pricing. 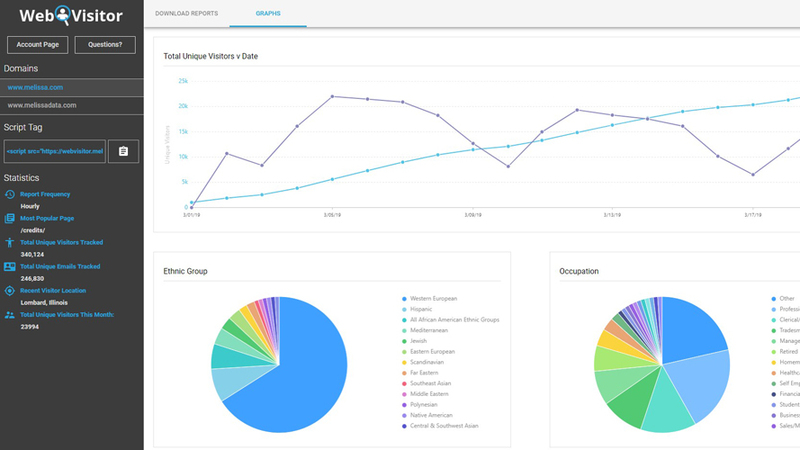 Easily access reports within your user dashboard. Reports are generated hourly, daily, weekly or monthly, depending on your business needs. Get a quick count of your most visited webpages, your top website visitors, and the email address for those most active on your site. 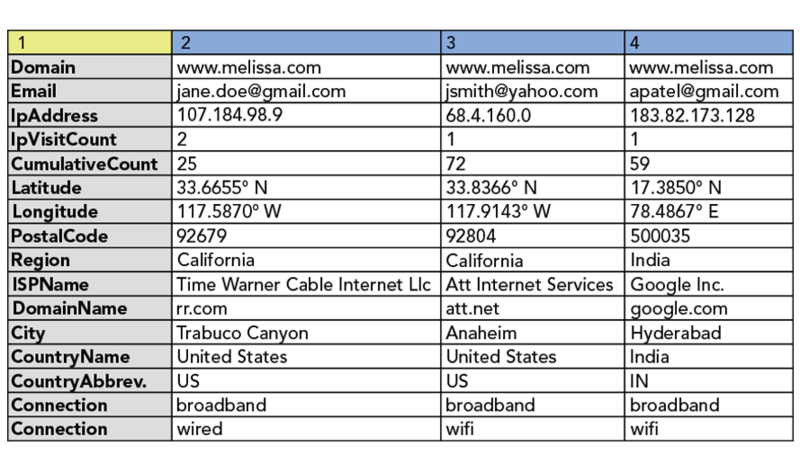 Download the location information – down to the latitude/longitude coordinate – for each email and/or IP address, along with the associated ISP and domain name. Here, first and last name, address including ZIP+4, email address and phone number are returned. 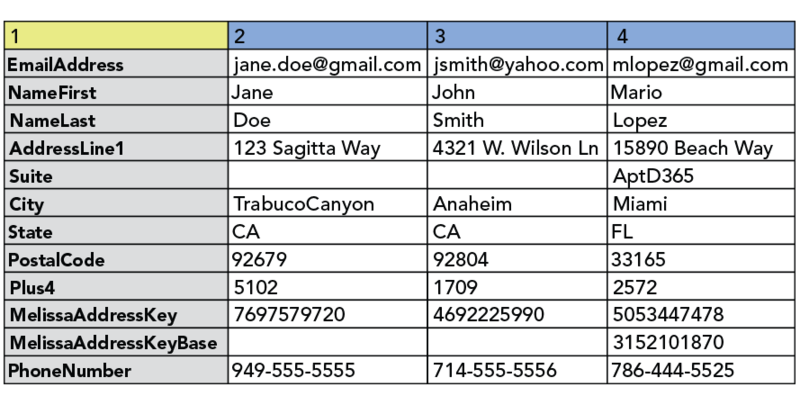 The Melissa Address Key can be used to further enrich your database with deeper location intelligence.